My wife and I consulted Duke Spence of Exclusive Estate Sales of Maryland (EES) to assist us with a unique whole house sale prior to a complete renovation. We requested that everything within the house be deemed sell-able from home-goods to windows, doors and ceiling fans. A marathon of questions and concerns for us, was met in-stride by Mr. Spence in a confident and professional manner. Mr. Spence was able to provide us with an accurate assessment of earning potential and guided us through all stages of preparation through completion of our sale. We were impressed by his personal approach, clear communication skills and his strong attention to detail. For example, protecting our neighbor’s property through effective parking signage, establishing display tables with custom cloth covers and providing high quality lighting to showcase our items. Further, he possesses a strong knowledge of all topics from carpets and coins to construction and crawlspaces. His understanding and familiarity with everything under our roof gave us peace of mind that our home and items would be well represented. Mr. Spence is a motivated, optimistic and upbeat leader of EES. His staff reflects and shares the same positive and strong work ethic. They are friendly and honest, showed creativity in staging our sale and handled all customers with professionalism. Everyone is approachable and all tasks were shared with enthusiasm. Due to construction timing we were obligated to conduct our sale the week after Christmas. My wife and I were concerned that buyer turnout would be low during this time of the year. Further, we were faced with heavy rain, cold temperatures and overcast skies. Despite the timing and weather, we had over 11,000 web site views of our property and had approximately 3000 buyers experience our sale. We had an above average turn out and we sold 90-95% of our inventory including the KITCHEN SINK!!! We are so happy to have chosen EES as their professional presentations and vast advertising network guided us to a highly successful sale! Not only did we have the luxury to vacate our home on time and with little excess, we feel we gained a team of friends with Mr. Spence and his staff. In closing, Duke Spence is a man of integrity, his staff is hard-working and no effort was wasted. His projection of value was accurate and all home-goods including our house were treated with care. Exclusive Estate Sales of Maryland receives our highest recommendation. In July 2017, thinking that my husband and I were getting a contract for the sale of our house and would need to downsize before our move, I contacted several estate sale companies and had in-depth personal meetings with two, including Exclusive Estate Sales of Maryland. Duke Spence and daughter Amanda came to my house, and after meeting with them, I knew their company would be the one to handle my estate sale. Around that time, the contract fell through so I didn’t need their services, but I recommended them highly to two different sets of friends who had just sold their homes and were also downsizing. Both contracted with Duke and their estate sales were great successes. My friends couldn’t have been more pleased with Duke’s services. As it turned out, I didn’t contract with Duke and his company until October, 2018. Our sale was scheduled for November, and the weekend before Duke and his staff entered our house, and it became a whirlwind! They were wonderful individuals—highly energetic and very knowledgeable about any type of item, from tools in the garage to fine china, crystal, and silver to fine jewelry and art work. Every item was individually priced and beautifully displayed on their cloth-covered tables or lighted display cabinets. I felt as though my home had been transformed into a fine department store or elegant gift shop—well, except for the tools. Though the tools wouldn’t have been found in a gift shop, they also were priced individually and displayed on tables in the garage, and that turned out to be the first place visited by most of the men who came to the sale! On the days of the sale, Duke’s staff arrived early and ready to work. I can’t speak highly enough about each one of them: they were kind, professional, interacted well with the visitors to the sale and knew how to sell. As items sold, they were recorded individually and at the end of the sale, I received a full accounting of each item that sold and for what price. The sale itself and the accounting and distribution of proceeds afterwards was handled with the utmost integrity. I have since recommended Duke Spence and Exclusive Estate Sales of Maryland to several other friends and I will continue to do so. I truly cannot imagine having any other company handle an estate sale! In early 2018, my wife and I signed a contract with Exclusive Estate Sales of Maryland. We were selling our house and moving to a new home out of state. An important part of the move was downsizing, requiring us to part with several pieces of furniture and other items in our house. A friend of ours who had moved several months earlier recommended we contact Duke Spence of Exclusive Estate Sales of Maryland and have an estate sale. Our experience with Duke was extraordinary. The professional manner in which he and his crew prepared the house for the sale, handled the sale, and cleaned up after the sale surpassed our expectations. Neighbors who saw the crew arrive over several days to prepare for the sale were impressed with the number of people involved and the industry with which they did their work. When we arrived at the house after preparations were complete, we were astounded by how every item was arranged in display cases or on tables covered in linens. It was a literal showcase. When we again returned after the sale, the house had been returned to a pristine state with only a few items unsold. The sale exceeded our expectations from both a financial and personal perspective. We are extremely pleased and recommend and endorse Exclusive Estate Sales of Maryland without reservation. If you are looking for the most professional estate sale company, you need to check out Exclusive Estate Sales of Maryland. Duke and his team are exceptionally knowledgeable, customer focused, with the highest integrity. From the first phone contact to the wrap-up of my parent's sale, Exclusive Estate Sales of Maryland’s processes exceeded all expectations. Duke's initial assessment of the materials and sale's goals were perfectly on-target. Staging the house the week before was meticulously performed, with great care in analyzing each household item, pricing, and display, turning the house into a real store. The sale was beautiful and quite a surprising showcase. The team's extensive knowledge in coins, jewelry, antiques, and all collectibles made a significant difference in the success of the sale. Throughout the three day sale the team was delightful, working tirelessly in assisting a very large customer base, and delivering on all sale goals. My husband and I researched various options and visited live sales held by several companies for comparisons in the area before selection. Without question, Duke and his team surpassed all other companies we visited, through their quality of service and business style - they are 'night and day' above the three other companies we considered. Since our family's estate sale, we have observed the Exclusive Estate Sales team at multiple events. Their honesty, integrity and commitment to doing the right thing never waivers. They are truly remarkable, results driven leaders with outstanding business acumen - - a First Class business initiative with our highest recommendation. Recently I had the pleasure of working with Duke Spence of Exclusive Estate Sale of Maryland. It was a difficult time for me, both emotionally with the recent passing of my father and coping with the passing of my mother in June 2015 as I was preparing an estate sale for the contents of their house located in Indian Head, MD. After talking with several companies that provided estate sales I contacted Duke Spence and understanding my situation and time constraints, he found time to meet with me immediately. Duke explained all aspects of the process of an estate sale very thoroughly, covering many things I had not even thought of, and answered all of my questions. He and his team went above and beyond arranging to get the house ready for the sale. The estate sale itself was a great success and he provided the paperwork and proceeds from the sale in a very timely manner. I found him and his team to be highly professional and personable. I would recommend them without reservation. Duke and the Exclusive Estate Sales team were organized, professional, knowledgeable, and monitored our sale carefully from start to finish. I interviewed three companies, and Exclusive Estate Sales was by far the best for our needs. Highly recommend them. In the summer of 2017 we were planning to downsize and move from a large home in Reisterstown to a rowhome in Baltimore. In doing some research, we concluded that an estate sale would be a worthwhile way of selling everything in our home (accumulated for the past 14 years) and starting anew as ‘urbanites’. After researching several estate sales companies, and personally meeting with the top 3 in our area, we ultimately decided to go with Exclusive Estate Sales of Maryland. The years of experience that Duke and company had in managing whole house estate sales. This was important as we had no experience. Duke’s level of knowledge and integrity along with a very successful and detailed business model. The feedback from past customers that was consistently excellent not only about the overall success of their sales but also the positive feedback about Duke/team’s integrity and comprehensiveness. We made the right decision! Duke’s team was professional, mature, honest and very accommodating throughout the process from contract review -> set up (they supplied all display cases and tables; thoroughly researched all items for sale to insure proper pricing (there were hundreds of items!) -> meticulous pricing and labeling -> excellent staffing for the weekend of the sale (all experienced professionals) -> crowd management and security -> fair negotiations -> detailed documentation of all inventory and sales results. Essentially, this was a complete turnkey operation. The end result was more than we could have hoped for. The sales attendance was amazing. While I was totally skeptical about getting folks to show up, Duke assured me he would drive the traffic. He did! For 3 days he and team managed everything. Our estate sale was a total success!! We made significant money, had to do very little, and ended up with new friends- Duke, Ann Marie and Amanda! Without any hesitation I recommend Exclusive Estate Sales for any size or level of sale. The team’s work ethic, patience, knowledge and -above all- integrity, will ensure success for any size sale. We are happy to speak to anyone about our personal experience with Exclusive Estate Sales if you would like any more details. Thank you, Duke, Annemarie, & Amanda and the Exclusive Estate Sales team for a wonderful experience! 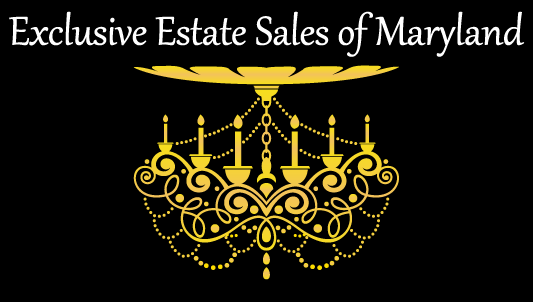 Hiring Exclusive Estate Sales of Maryland to run our estate sale was a great experience. The owner, Duke Spence was very accommodating right from the beginning. During our initial consultation he took time to review our inventory and to discuss mutual expectations. We could tell right away that he was experienced and knowledgeable. He hires great people to help him with setup and the actual event. We found them all hardworking and respectful. They set up for the sale beautifully and strategically organized and placed our items to optimize the available space and create interest. During the sale Duke made sure there was enough staff to circulate throughout the whole house to ensure security and assist shoppers. Following the event, we received an itemized accounting of all items sold and a timely payout. The fees charged were commensurate with the time, effort, and resources Exclusive Estate Sales invested in the event. Duke has great work ethics and runs his sales expertly. We highly recommend his services. I discovered Exclusive Estate Sales of Maryland after interviewing several estate sale companies and auctioneers concerning my late mother's estate. I have to express how truly grateful I am to be working with them. The Spence family runs a class "A" company. The time and attention to detail taken in handling, preparing and staging my mother's home to conduct the sale was nothing short of amazing. I particularly appreciate the time that was taken with me during our initial consultation. I had limited knowledge of estate sales having only attended one and not having the most positive experience. I wasn't sure what to expect or what people are actually interested in buying. Mr. Spence completed a walk through of my home and was able to determine that my mother had nice things, cared for them and there was indeed a market for her house full of "stuff". Another thing I can appreciate is that Exclusive Estate Sales understands marketing and the "psychology" of a sale. They know where to place various items in the rooms and levels of your home so as not to compete leaving one floor or room overlooked by shoppers. They truly turn your home into a store which translate into a serious and high quality sale. During my recent sale, I overheard so many customers discussing how wonderful a sale it was. Not only the available items, but how my sale was conducted. None of it would have been possible without Exclusive Estate Sales of Maryland. I wholeheartedly recommend their services in handling your love one's possessions. Great sale at Bay Head Road...well presented and well-staffed. We are so pleased with the job you and your sales managers performed on behalf of our family and the estate sale. You exceeded our expectations and your dedication showed with everyone was incredible. It was a difficult time for our family and your knowledge, honesty, responsibility and caring made it so much easier to deal with, We gave you a key, and you cleaned out the items that were left over and made donations, consignments and an entire truckload of trash disappear. What a great job! We are truly thankful for the job you all did and have made a great friendship.